East Java (Indonesian: Jawa Timur, abbreviated as Jatim, Javanese: Jåwå Wétan) is a province of Indonesia. Located in eastern Java, it includes the island of Madura, which is connected to Java by the longest bridge in Indonesia, the Suramadu Bridge, as well as the Kangean and Masalembu archipelagos located further east and north, respectively. Its capital is Surabaya, the second largest city in Indonesia and a major industrial center. Banyuwangi is the largest regency in East Java and the largest on the island of Java. It covers an area of 47,800 km2, According to the 2010 Census estimates, there were 37,476,757 people residing in the East Java, making it Indonesia's second-most-populous province; the latest official estimate (for January 2014) is 38,529,481. It has a land border only with the province of Central Java to the west; the Java Sea and the Indian Ocean border its northern and southern coasts, respectively, while the narrow Bali Strait to the east separates Java from Bali. The Dinoyo inscriptions found near the city of Malang arethe oldest written sources in East Java, dating from 760 CE. They tell of many political and cultural events in the Kingdom of Dinoyo. The name of Malang nais thought to come from the name of a sacred building called Malangkuseswara. This name is contained in at least one inscription, namely, the Mantyasih inscription written in 907 CE. In 1222, Ken Arok founded the Kingdom of Singhasari, which he ruled until 1292. Before coming to power, Ken Arok seized power in Tumapel (Kediri) from Tungul Ametung. Ken Arok dynasty's descendants became kings of Singhasari and Majapahit from the 13th until the 15th century. In 1227, Anusapati killed Ken Arok, and later became king of Singasari. Anusapati's power only lasted 20 years, before he was killed by Tohjaya. Three years later, Tohjaya was killed in the uprising led by Jaya Wisnuwardhana, son of Anusapati. In 1268, Wisnuwardhana died, and he was succeeded by Kertanegara (1268-1292). In 1292 Kertanegara was defeated by a rebel named Jayakatwang, ending the power of Kertanegara power and the history of Singhasari. In 1294, the Kingdom of Majapahit was founded. Its founder was Raden Wijaya. Majapahit reached its peak during the reign of Hayam Wuruk. He was accompanied by the mahapatih Gajah Mada. Together they managed to unite the vast territory under the name Dwipantara. In 1357, the Bubat event occurred, the war between the King of Sunda and the Majapahit Patih Gajah Mada. This event stems from the desire to take the king Hayam Wuruk Sundanese princess named Dyah Pitaloka as queen. However, because of a misunderstanding about the procedure of marriage, the plan led to a battle in Bubat. Majapahit troops, under the command of Gajah Mada defeated Pajajaran. In 1389, Hayam Wuruk died, and was succeeded by Wikramawardhana. This era was the beginning of the collapse of Majapahit. After that period, Islam began to spread across Java and the Europeans started their colonisation of the Malay archipelago. At the beginning of the 20th century, the royal government system was abolished, replaced by a system of residency. During the Japanese occupation of the Dutch East Indies, there was persistent resistance against the Japanese rule. In Blitar, an uprising by PETA (Defenders of the Homeland) led by Supriyadi, Moeradi, Halir Mangkudijoyo, and Soemarto occurred in early 1945, but it was crushed by the Japanese. Two weeks after the proclamation of independence, Surabaya established its own government in the shape of a resident, R. Sudirman. The formation of government in Surabaya caused disputes between the republican forces and Japanese troops, resulting in various skirmishes across the city. This was because when the Japanese surrendered, they were obliged to remain in power until the allied forces arrived. The arrival of Allied forces in Surabaya created tensions with the newly established government of Indonesia, reaching peak on 10 November 1945 where a major battle between the Surabayan residents led by Sutomo and Allied forces. The battle forced the governor, Suryo, on the advice of People's Security Army (TKR), to move the seat of the government to the Mojokerto area. A week later, the government retreated again to a more secure location in Kediri. However, security situation Kediri worsen until finally, in February 1947, the East Java provincial government fled to Malang. While the administration was based in Malang, Gobvernor Suryo was replaced by R.P. Suroso, who was in turn replaced again by Dr. Moerdjani. On 21 July 1947, although still bound by the Linggadjati Agreement and a ceasefire agreement in effect since 14 October 1946, the Dutch commenced a military action, Operation Product, which led to deteriorating security conditions in Malang. The East Java provincial government finally moved again to Blitar. This military action ended after the Renville Agreement. However, this agreement had negative consequences for East Java, namely, a reduction in the territory controlled by the East Java provincial government. 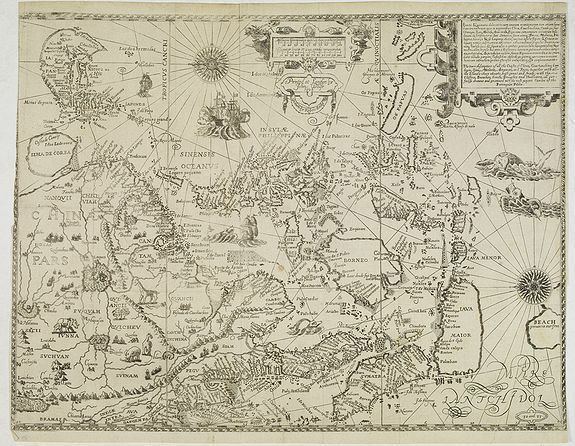 The Netherlands then turned the areas under its control into new states, such as the State of Madura and the State of East Java. Amid the difficulties faced by the government of Indonesia, a left-wing opposition group, Front Demokrasi Rakyat (FDR, People's Democratic Front) launched rebellion in Madiun on 18 September 1948, which is known as the Madiun Affair. However, eventually this revolt was defeated by the Indonesian Army. On 19 December 1948, the Dutch launched Operation Kraai. Blitar, which the seat of the East Java provincial government was attacked by the Dutch. Governor Dr. Moerdjani and his staff were forced to flee and joined the guerrillas on the slopes of Mount Willis. Operation Kraai ended after the Roem–van Roijen Agreement on 7 May 1949. Following the Dutch–Indonesian Round Table Conference, at which the Netherlands agreed to transfer sovereignty to the United States of Indonesia, the Dutch withdrew its troops from East Java. East Java changed its status from a province into a state. However, on 25 February 1950, this was dissolved and became part of the territory of the Republic of Indonesia. The State of Madura also decided to join Indonesia. East Java province borders the Java Sea in the north, the Strait of Bali in the east, the Indian Ocean in the south, as well as the Central Java province in the west. The length of the east-west stretch of about 400 km. The width of the stretch of the north-south in the west about 200 km, but in the eastern part of narrower by about 60 km. 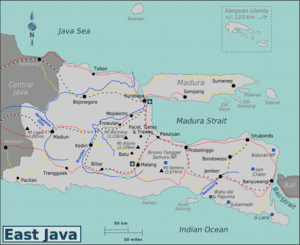 Madura is the largest island in East Java, separated from the mainland Java by the Strait of Madura. Bawean Island is located about 150 km north of Java. In the east of Madura there are a cluster of islands, the easternmost is Kangean Island and the northernmost is Masalembu Islands. In the southern part there are two small islands namely Nusa Barong and Sempu Island. In physiographic, East Java Province can be grouped into three zones: the southern zone (plato), the middle zone (volcanic), and the northern zone (folds). Lowlands and highlands in the middle (of Ngawi, Blitar, Malang, to Bondowoso) has a fairly fertile soil. In the northern part ( Bojonegoro, Tuban, Gresik, to Madura Island) lies the Kapur Utara mountains and the Kendeng mountains which are relatively barren . In the middle of the province stretch mountain ranges and volcanoes: On the border with Central Java is Mount Lawu (3,265 metres). Southeast from Madiun is Mount Wilis (2,169 metres), and Mount Liman (2,563 metres). In the middle of the corridor lies the Anjasmoro mountains with peaks Mount Arjuno (3,339 metres), Mount Welirang (3,156 metres), Mount Anjasmoro (2,277 metres), Mount Kawi (2,551 metres), and Mount Kelud (1,731 metres); The mountains are located in most Kediri, Blitar, Malang, Pasuruan, Mojokerto and Jombang. The group has the peak of Mount Bromo Tengger (2,329 metres), and Mount Semeru (3,676 metres). Mount Semeru, which is also called Mahameru is the highest mountain in the island of Java. In the easternmost part if the province, there are two groups of mountains: the Iyang mountains with the peak Mount Argopuro (3,088 metres), the Ijen mountains with the peak Mount Raung (3344 metres) In the south there is a series of hills, that of the south coast of Pacitan, Trenggalek, Tulungagung, Blitar, Malang. the Kapur Selatan mountains is a continuation of a series of the Sewu mountains in Yogyakarta. Two of the most important rivers in East Java is the Brantas River (290 kilometres), and the Solo River (548 kilometrrs). Brantas River has headwaters on the slopes Mount Arjuno near Batu, and flows through most areas in East Java, like Malang, Blitar, Tulungagung, Kediri, Jombang and Mojokerto. In Mojokerto, Brantas River split into two: Kali Mas, and Porong; both empties into the Madura Strait. Solo River has headwaters on the slopes of Mount Lawu which lies on the border of East Java and Central Java, and flows through a portion of the eastern part of Central Java and East Java, which eventually empties in Gresik. Brantas River and Bengawan Solo are managed by Perum Jasa Tirta I. On the slopes of Mount Lawu near the border with Central Java are Sarangan, a natural lake. The main dam in East Java, among others Ir. Sutami and Selorejo Dam, which is used for irrigation, fish farming and tourism. East Java has a wet tropical climate. Compared with the western part of Java Island, East Java in general has less rainfall. Average rainfall is 1,900 mm per year, with a rainy season during the 100 days. The average temperature ranges between 21-34 °C. Temperatures in the lower mountain areas, and even in areas Ranu Pani (slopes of Mount Semeru), temperatures can reach minus 4 °C, causing a downfall of soft snow. According to the 2000 census, East Java had 34,765,993 people, which increased to 37,476,757 people at the 2010 Census, making it the second most populous Indonesian province after West Java. Akin to Central Java, the region's birth rates are not necessarily any lower than the rest of Java, however due to net population outflows, especially in times of calamity, not limited to volcanic eruptions or droughts, the region has varying rates of population growth that are generally lower than national average. Ethnic Javanese dominate the Java mainland as well as the total population of the province overall, while ethnic Madurese inhabit Madura and the Kangean and Masalembu archipelagos, though centuries of migrations have led the Java mainland to have a larger proportion of Madurese people than Madura itself. Minorities include distinct Javanese ethnicities such as the Tengger people in Bromo, the Samin and the Osing people in Banyuwangi. East Java also hosts a significant population of foreign ethnic groups, such as Chinese, Indians, and Arabs. Besides the formal language, Indonesian, East Java people use Javanese as daily language. Javanese as spoken in the western part of East Java (Kulonan) is a similar dialect to the one spoken in Central Java, with its hierarchy of high, medium, and low registers. In the eastern part, such as Surabaya, Malang, and others, a more egalitarian version of Javanese is spoken, with less regard of hierarchy and a richer vocabulary for vulgarity. The dialect is notable for its roughness compared to other dialects spoken elsewhere in Java (especially the Mataram dialect spoken around Surakarta and Yogyakarta, which is renowned for its smoothness) and contributes to the stereotype among Javanese people of East Javanese being "blunt" and "loud". Variants of Javanese are also used by Osing and Tengger minorities, the former utilizing a Balinese-influenced Javanese by virtue of its closeness with Bali island, and the latter speaking an archaic form of the language that retains many features now lost in other more-innovative Javanese dialects. Other than Javanese, minority language includes Madurese, spoken by around 15 million ethnic Madurese people inhabiting Madura and the Kangean and Masalembu Islands. Though they live practically next door with the Javanese, the language is actually more closer genetically to Balinese, Malay, and Sundanese. A long time ago, Hinduism and Buddhism dominated the island until Islam gradually supplanted Hinduism in the 14th and 15th century. The last nobles and people of the fallen Majapahit fled to Bali. Islam spread from northern cities in Java where many Muslim traders from Gujarat, India stopped by. The eastern part of East Java, from Surabaya to Pasuruan, and the cities along the coast, and back to Banyuwangi to Jember, are known as the eastern salient, or "Kawasan Tapal Kuda" (The Horseshoe region). A remnant of Hindu tradition and syncretic abangan is exist because of Islamic and Hinduism acculturation in Java. East Java has a number of distinctive art. Ludruk is one of the East Javanese art is quite well known, namely the art of the stage that generally all the players are male. Unlike the Ketoprak which tells the life of the palace, ludruk tells the daily life of ordinary people, often spiced with humor and social criticism, and generally opened with Dance Remo, and parikan. Currently traditional ludruk groups can be found in the area of Surabaya, Mojokerto and Jombang; although its presence increasingly defeated by modernization. Reog from Ponorogo is a typical art that has been patented since 2001, reog now also become the icon of East Javanese art. Staging reog accompanied by horse braid (kuda lumping) are accompanied by elements of the occult. Famous art of East Java, among others puppet purwa East Javanese style, mask mastermind in Madura, and made. In the area Mataraman Middle Javanese arts such as Ketoprak, and shadow puppets are quite popular. Famous legend of East Java, among others Damarwulan, Angling Darma, and Sarip Tambak-Oso. Traditional dance in East Java can be generally grouped into Middle Javanese style, East Javanese style, Osing style and Madurese styles. Classical dance, among others are gambyong dance, dance srimpi, dance bondan, and wanderer. There is also a sort of lion dance culture in East Java. Art exists in two districts namely, Bondowoso, and Jember. Singo Wulung is a distinctive culture Bondowoso. While Jember have the tiger kadhuk. Both art that is rarely encountered. Culture and customs of Javanese in the western part of East Java received a lot of influence from the Middle Javanese, so this area is known as Mataraman; indicate that the area was once the territory of the Sultanate of Mataram. The area includes the former residency of Madiun (Madiun, Ngawi, Magetan, Ponorogo, Pacitan), ex-residency Kediri (Kediri, Tulungagung, Blitar, Trenggalek, Nganjuk), and part of Bojonegoro. As is the case in Central Java, wayang kulit, and Ketoprak quite popular in this region. East Java's west coast region is heavily influenced by the Islamic culture. This area covers an area of Tuban, Lamongan and Gresik. In the past the north coast of East Java is the entry area, and the center of the development of Islam. Five of the nine members of the walisongo are buried in this area. In the area of ex-residency of Surabaya (including Sidoarjo, Mojokerto and Jombang), and ex-residency Malang, had little cultural influence Mataraman, considering this region is an area arek (the term for offspring Kenarok), especially in the area of Malang that make this area difficult to be affected by Mataraman culture. Customs in horse hooves region heavily influenced by the culture of Madura, given the magnitude of Madura tribe population in the region. Osing social mores of the culture is a blend of Java, Madura and Bali. While the Tenggerese tribe is heavily influenced by Hindu culture. Villagers in East Java, as well as in Central Java, has ties based on friendship, and territorial. Various ceremonies were held, among others: tingkepan (ceremony gestational age of seven months for the first child), babaran (ceremony before the birth of the baby), sepasaran (ceremony after the baby was five days), Pitonan (ceremony after the baby was seven months old), circumcision, fiance. East Java's population generally embraced monogamy. Prior to application, the men doing the show nako'ake (ask if the girl already had a husband), once that is done peningsetan (application). The wedding ceremony was preceded by a gathering or kepanggih. Communities on the west coast: Tuban, Lamongan, Gresik, even Bojonegoro has a habit of women's families applying common man (Ganjuran), different from the usual habits of other regions in Indonesia, where the men apply for women. And generally men will then be entered into the family of the woman. To pray for the deceased person, usually a family party did send donga on day 1, 3rd, 7th, 40th, 100th, 1 year and 3 years after death. East Java hosts famous universities in Indonesia, both owned by government and private. Three major cities for universities are Surabaya, Malang, and Jember; there is also a university at Bangkalan on Madura island. Among them, University of Airlangga and Institut Teknologi Sepuluh Nopember are the most famous of the province's universities, and both are located in Surabaya. Another important form of education that is available in most cities in East Java is the pesantren. This is a kind of socio-education organized by Islamic clerics, and associated with local or national Muslim organizations. Jombang is a famous region for its pesantren. East Java supports several regional media outlets. Local newspapers with provincial news reach their readers earlier than their competitors from Jakarta. In the spirit of "providing more news from around readers", most newspapers even issue municipal sections which are different among their distribution areas. Jawa Pos Group, one of the major newspaper groups in Indonesia, based in Surabaya. Surya, is a newspaper based in Surabaya. (owned by Kompas Group). Malang metropolitan region is a famous tourist destination in Indonesia with the City of Batu as its center. East Java has a number of interesting sights. One of the tourist icon is Mount Bromo in East Java, which is inhabited by the Tengger tribe, where the ceremony is held every year Kasada. In the mountainous region of Tengger also there is a waterfall that is Madakaripura which is the last hermitage Mahapatih Gajah Mada before serving in the kingdom of Majapahit. Madakaripura Waterfall has a height of about 200 meters, which makes it the highest waterfall on the island of Java and the second highest in Indonesia. East Java also has some other mountainous tourist area of which is Malang Raya mountainous area known as the natural mountain tourist area that includes Malang and Batu. Tretes and Trawas mountainous areas, are also known to have characteristics such as Puncak area in West Java province. Other natural attractions in East Java is the National Park (4 of 12 National Parks in Java) and Taman Safari Indonesia II in Prigen. East Java is also contained relics of history in the classical era. Trowulan sites in Mojokerto, once the center of the Majapahit Kingdom, there are dozens of temples and tombs of the kings of Majapahit. Other temples spread throughout much of East Java, including Penataran temple in Blitar. In Madura, Sumenep is the center of the kingdom of Madura, where there are Kraton Sumenep, museums, and the tombs of the kings of Madura (Asta Tinggi Sumenep). East Java is known to have a very beautiful coastal scenery. On the south coast there is the Prigi Beach, Pelang Beach and Pasir Putih Beach in Trenggalek, Popoh Beach in Tulungagung, Ngliyep Beach, and tourism areas such as the Jatim Park, Batu Secret Zoo, Batu Night Spectacular, Eco Green Park in Batu, and the Watu Ulo Beach in Jember. East Java also has a beach that the waves is one of the best in the world, namely the Plengkung Beach located in Banyuwangi. In addition there Kenjeran Beach in Surabaya, and the White Sand Beach in Situbondo. Lake in East Java, among others Sarangan in Magetan, Ir. Sutami Dam in Malang, and Selorejo Dam in Blitar. The coastal area of the north there are a number of tombs of the saints, who become religious pilgrims travel for Muslims. Five of the nine walisongo buried in East Java: Sunan Ampel in Surabaya, Sunan Giri, and Malik Ibrahim in Gresik, Sunan Drajat in Paciran (Lamongan), and Sunan Bonang, Tuban. In the northern coastal region there are also interesting caves are: Cave Maharani in Lamongan and Tuban Akbar Cave and Cave Gong located in Pacitan is known as the most beautiful caves in Southeast Asia. Pilgrimage attraction in East Java, among others, the tombs were also proclaimed the Republic of Indonesia's first president Soekarno contained in Kota Blitar, as well as the tomb of the fourth Indonesian president Abdurrahman Wahid / Gus Dur is located in Jombang. Malang Metropolitan Region is a leading tourist destination in Indonesia with the City of Batu as its center. Malang has various tourist areas of natural beauty ranging from volcanoes to beaches, as well as man-made tour of the history of travel to an international-class theme park with the support of inter-provincial transportation via trains, buses, and airplanes are available in Malang. Surabaya is the center of government, and the business center of East Java, where there are Tugu Pahlawan, the Museum MPU Tantular, Surabaya Zoo, Submarine Monument, Ampel Region, and the Tunjungan area. Meru Betiri National Park - Between Jember and Banyuwangi districts, this park covers 580 km2 (224 sq mi). Hard to get to, it contains fantastic coastal rainforest and scenery and is home to abundant wildlife. Alas Purwo National Park - This 434 km2 (168 sq mi) park is formed by the Blambangan Peninsula (southeastern Java). Comprising mangrove, savanna, lowland monsoon forests and excellent beaches, the park's name means First Forest in Javanese. Javanese legend says that the earth first emerged from the ocean here. Baluran National Park - This 250 km2 (97 sq mi) national park is located in northeastern Java, known as The Little Africa, formerly extensive savanna has been largely replaced by Acacia. 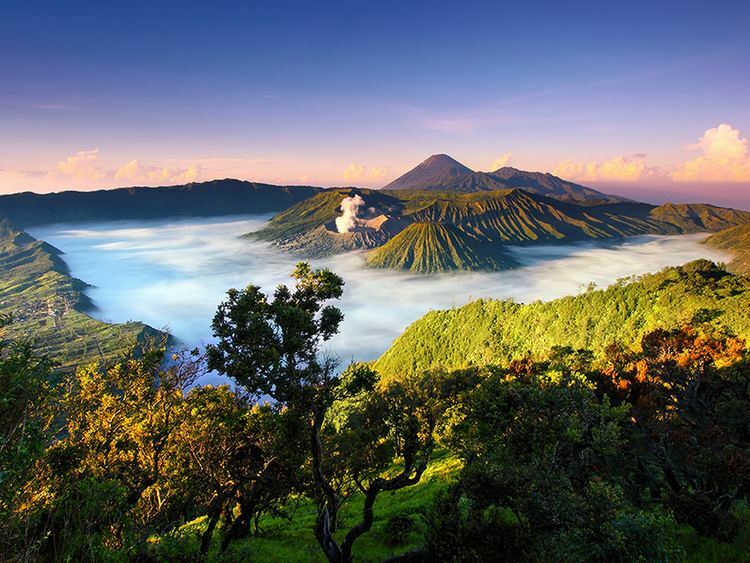 Bromo Tengger Semeru National Park - Located in East Java at the region of Probolinggo and Pasuruan, 70 km (43 mi) from Surabaya the capital city of East Java province. Mount Bromo is one of the great hiking and trekking destinations for overseas tourists. The scenic view of Bromo also attracts hundreds of photo enthusiasts to see the views there.